The K League Classic is now last than 2 weeks away and as we’ve already covered a number of other sides we thought we’d keep going. 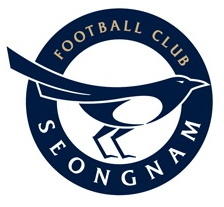 This time we’re looking at Seongnam FC (previously called Seongnam Ilhwa Chunma FC). The side was bought from the previous owners by the city and so this is their first season as Seongnam FC. Seongnam FC will play their Home games at the Tancheon Sports Complex, just as the previous Seongnam based team did last season. It’s maybe best accessed by walking from Yatap Station (Bundang Line). Here are the 2014 K League Classic fixtures for Seongnam FC. It’s available as either a JPEG image or as a high quality PDF file (below). There is one long break you should take note of; From the middle of May to mid July the league takes a break for the 2014 FIFA World Cup. Compared to other K League Classic sides Seongnam FC have a pretty even split of Home and Away games. Here are a few useful links to find out more information on both Seongnam FC and the K League Classic in general. 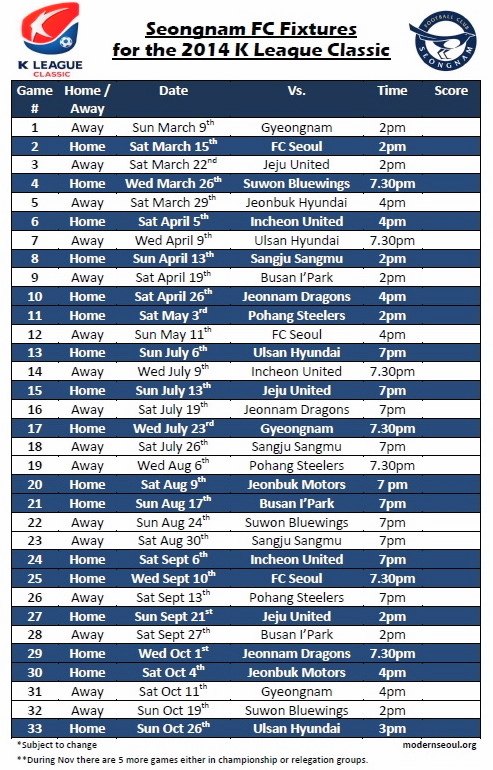 If you have any questions or comments regarding supporting / watching Seongnam FC this 2014 season please feel free to let us know. Also if you have any questions about the K League or football (soccer) in Korea in general please let us know, either via email, our Social Media Homes or by commenting below.